“You must read Bedelia”, the seductive black-widow thriller by the author of the classic film noir, Laura (The New York Times). Charlie Horst has returned with his new bride, Bedelia, to his family home in Connecticut. Indulgently infatuated, Charlie is the luckiest man alive. What’s not to love about Bedelia? She’s gorgeous and complacent. She’s also a gracious and ideal party host—luscious and decorative in blue velvet. And in public, she plays the part of worshipful wife to perfection. In private, even more so. Who can blame Charlie for overlooking her little deceptions? Or for not paying any mind to her contradictory claims about her past? When Charlie falls ill due to a freak poisoning, Charlie knows that Bedelia will be right his side, watching him closely. But who’s watching Bedelia? “Vera Caspary wrote thrillers—but not like any other author of her time, male or female. Her specialty was a specific type that she pioneered—the psycho thriller” (Huffington Post) and this “sinister entertainment” (The New Yorker), is Caspary at “her most chilling” (SistersinCrime.com). Filmed in 1946, and starring Margaret Lockwood, it’s “a tour de force of psychological suspense . . . Desperate Housewives meets Double Indemnity in Bedelia” (Liahna Armstrong, President Emeritus, Popular Culture Association). I have read several of these Femmes Fatales offerings and have appreciated the opportunity to delve into pulp fiction from different eras. This novel was especially enjoyable because of the way the author lets the story unfold and keeps the reader guessing as to whether Bedelia is black widow or victim, whether Ben, the neighbor, is accomplice or nemesis. According to the Afterword, the author wanted to set the novel in 1913, rather than make it contemporary, to illustrate how few options women had then. Nevertheless, she presents us with Ellen as a foil to Bedelia. Ellen is also in love with Charlie, but she and her friend Abbie represent a completely different kind of woman. As Abbie says to Ellen, "You and I, pet, have got too far from the harem. You earn your living and enjoy it. I have an income and live quite adequately alone. Men aren't our lords and masters. And they resent us." Bedelia, on the other hand, is "a man's woman. Men fall in love with her because she's crazy about men, and they sense it. She exists only for her man, her whole life is wrapped around him." The contrast between the way the two women conduct themselves and behave toward Charlie is stark. I also like how the author uses Charlie's background to show how he's influenced by his New England ancestors and by the way he was raised. His eyes often turn to his mother's portrait as he winces at the difference between the way she conducted herself and how Bedelia behaves. At one point Charlie reflects that, "The careful avoidance of all that was unpleasant and unsavory was not only Charlie's greatest fault, but the fault of his people and his class." How he ultimately resolves his dilemma is shocking but entirely consistent with his character. Overall, this was an absorbing and suspenseful read with much more depth than the average pulp thriller. I actually couldn't put it down - it is very fun, especially all the vintage details and a good mystery, and a bit creepy in that sort of antique store way. Interesting to think of Bedelia as a Feminist, in all her classic housewife glory. The author's biography is also quite fascinating. I read this during the summer, but it would be fun to read around the winter holidays, as it takes place then. This is the third "Femmes Fatales" I have read and I have enjoyed all of them. I want to see the movie of this one! This dark and steamy novel kept me flipping pages all night. What I didn't like? It seemed inconsistent to time period. An early mystery novel with a memorable set of characters. I found the book similar to and in some even better than Laura. I really enjoyed this book. 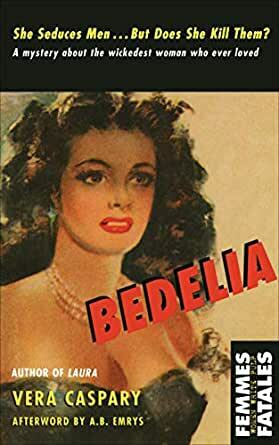 Bedilia is an interesting character and I am fascinated by the adventurous life led by the author.